The five precepts or five Gokai of Reiki just not important to Reiki practitioners but also to each and every individual. Dr.Mikao Usui gives us these principles. Just as Reiki is holistic in nature and works on different layers of an individual, these precepts are holistic in nature. 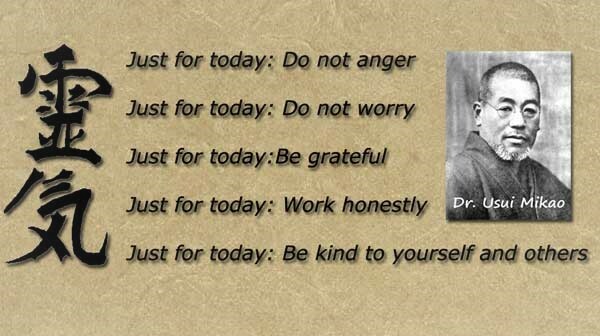 The effect of each of this principle is very positive when you follow these principles religiously. As a beginner, we may find it little difficult to follow, but with a daily Self-practice of Reiki, these principles become your second nature over the years. How these principles effect on all levels of existence, let’s see very briefly. Reiki is a journey from physical to metaphysical. The Level 1 Attunement ables a person for a hands-on Reiki i.e a person is now able to treat himself and others, by placing his hand very lightly on the physical body itself or a few inches above. By The Level 3 Attunement, a person is now able to invoke Reiki mentally, and do perform very subtle forms of Reiki on the mental level. Now, these percepts play a very important role while we are walking through the way of different levels of Attunement. Reiki very diligently works on our blockages, bring them to light, and give us an opportunity to work on them, and this process is not of course very easy. While going through all these attunements, we are taught to recite these principles very religiously, according to the situation, and it works magically. Now it is so habitual to me, that in any given situation, I just start to recite any one of this percept and it works without fail. In the five precepts of Reiki, there are some do’s and don’ts…..
First we will discuss what are don’ts in Reiki Percepts. We can see anger on a physical level, but it also affects your mental, emotional and spiritual level. Anger can impact the immune system and may result in other mental disorder. Anger lead to anxiety, it produces the same physiological and psychological effects of stress which leads to depression. Anger can impact the immune system and may result in other mental disorder. Anger leads to anxiety, it produces the same physiological and psychological effects of stress which leads to depression. Constant worry leads to stress hormones stimulates in blood circulations, results in tension in a nervous system and heart rate, this could result in Stroke and Heart Attack. What are the do’s in Reiki percepts? Be grateful for what we receive from this Universe, have gratitude. Robert Emmones, Scientific Expert on Gratitude writes, “It’s an affirmation of Goodness. We affirm that there are good things in the World, gifts, and benefits we have received.” Gratitude has a social dimension to it. Gratitude requires us to see how we’ve been supported and affirmed by other people. Gratitude has a social dimension to it. Gratitude requires us to see how we have been supported and affirmed by other people. George Simmel called Gratitude as ” the moral memory of mankind.” Surprisingly, recent scientific studies show very positive results of people practicing Gratitude. Stronger Immune System and lower blood pressure. Having general feeling of fulfillment. Being honest means choosing not to lie, steal or cheat in any way. Honesty is the best policy. Dishonesty can have short-term benefits, but it adversely affects your health, your relationships, your social status. A study at Notre Dame clealy stated that practicing honesty experience less depression, headaches and sore throats.Dishonesty needs to be maintained, so it could be very stressful. Honesty reduces stress. Honest people are better able to relax. In conclusion, we can say that the five precepts of Reiki are very well, thoughtfully given to us by Dr.Mikao Usui. These percepts look very simple but the Scientific benefits of practicing these precepts can be proved now. The result of practicing these precepts is not limited to the physical level but they are holistic in nature, we get results on all physical, mental, emotional, social and spiritual level. So let’s make them a part of our life, and live a peaceful life. The 5 percepts are very relevant to me. I need to practice more patience as I get angry quite easily. Lol! Hi Yvonne, you are absolutely right, you have to be kind to yourself first, and then only other percepts will follow automatically. These are principles which we supposed to follow, and these perepts are relevant to each and every person. Thanks for your kind words, Thanks. I have been just using Reiki for healing myself and my family. Lately, I am dealing with someone close to me who is going through some anger issues. Never really paid attention to The 5 Percepts of Reiki until now. Do not respond in anger to someone who is angry at you. Be kind. It doesn’t help to worry. It makes it worse. The opposite of worry is mindfulness. Even when things are falling apart, I can still be grateful. Also, be honest in how you treat and talk to others. with inner kindness, I am kind to others. Hi Beth , thanks for your comments, nice to see that you actually working on Reiki Percepts. When we start practicing Reiki, we find it little difficult to follow these percepts, but slowly and surely, you start to follow these percepts knowingly or unknowingly. Over a time, you become a totally different person, a better version. I personally would love to see you as a Reiki Master Teacher, Wish u all the best. Hey Santosh, thanks for your comment. 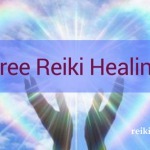 Reiki is a healing energy exists within all of us, you just need to attune it and you can heal yourself as well as others. After attunement, you just place your hands on yourself and healing occures. Healing on all levels – physical, mental, emotional and spiritual. The dimension of Reiki healing is beyond words, you have to experience it. Check this link for more info on Reiki.